Discussion in '2D Experimental Preview' started by rustum, Mar 14, 2018. We’ve been hinting at it for a while but now it’s time to share: We’re working on 2D animation. This is NOT an integration of Anima2D into Unity. We will be releasing it in multiple phases. Phase 1 of this work is now available as a preview package. This phase was focused on developing tooling for rigging a sprite for skeletal animation. The tools developed in this phase include: Bind-pose editing, manual mesh tessellation, skin weights painting. A runtime component ties this all together to drive sprite deformation. The goal of Phase 1 is to allow users to create simple animated characters that consist of a single sprite. This will be built on top of features and workflows developed in Phase 1. This includes tooling to make the creation of multi-sprite characters more efficient. We are also considering workflows for larger productions. The goal of Phase 2 is to allow users to create complex multi-sprite characters and potentially share rigs and animation clips across multiple characters. We believe we are at the end of Phase 1, and in order to progress into Phase 2 with confidence we need your feedback. We're eager to hear back from you so please reply to this post or create a new post to share your thoughts! To get the latest, follow the instructions in Getting Started above. OscarLeif, SiriusRU, Augmented_Island_Studios and 27 others like this. jorisvanlaar and _watcher_ like this. Will it be possible to animate using IK-handles? Looks pretty cool! We're long time users of Spine and love this sort of functionality. Has there been any improvements to the gimbal locking problems that the Unity Animation timeline suffers from when keying rotations? Isn't that exactly what the video above is demonstrating? Can you gimble lock in 2D? Good point! I guess not. I'm still weary of Unity's animation timeline vs something like Spine or Maya, though. Why? The current behavior makes more sense to me, as it lets you extend a skeleton, easily creating a chain of bones. If you want to create a branch, you need only select the parent bone. If it always created the new bone at the origin of the selected bone — i.e., created a branch — then how would you create a chain? MeteOzguz and theANMATOR2b like this. Click click click just like in Maya and in this thing A chain is an append to the previous bone. A bone is only a position transform and only acquires a rotation and a size when you click a second time. But maybe I'm wrong and maybe Maya is wrong too so have you actually tried appending a bone to a chain in this thing and found that it makes sense? Click click click just like in Maya and in this thing A chain is an append to the previous bone. So I guess I misunderstood you — I thought you were saying you didn't like this behavior. jhocking and laurentlavigne like this. Yes, that's correct, thanks for clarifying, I'm sure your input makes the dev work easier because obviously my description was not clear enough. This is great feedback! These are exactly the kinds of features we have in our plans. What other features are must-haves to support your workflows? It's very useful for us to know what workflows we should be supporting, so feel free to describe your needs in these areas as well. I'm still weary of Unity's animation timeline vs something like Spine or Maya, though. Do let us know what Spine and Maya provide that you are missing in Unity. Keep the input coming! We're learning a lot! Once your bone-based deformations are ironed-out, people will surely start asking about this. 2) And If you plan to have anything resembling vertex-level deformation support, having something like Creature's "motors" (algorithms that run on top of vertex matrices, bones, or "mesh regions") would be helpful to speed up the workflow N-fold. Performance-wise there are different levels of optimization features, fastest of them being - you can bake only vertex positions of your mesh, if you don't need physics interactions, sprite swapping or bone manipulation, resulting in extremely high animation performance. jorisvanlaar, dadude123, theANMATOR2b and 1 other person like this. I've been using Anima2D for over a year now and seeing this makes me very excited. If you guys can pull off features proposed in Phase 2 I'd switch to this on my next project, for sure. I played around Phase 1 and I think it's an amazing start. I think you should prioritize ease of sprite switching. An example would be a character that could have equipable armor. An easy way to keep the skeleton but swap out the helmet or chest piece. The correct bone should bind but the sprite should have its own mesh tesselation. Are there plans for a spring bone (for cloth/rope sprites)? djweinbaum and laurentlavigne like this. If you change the skeleton you need to make sure you regenerate it in the scene. To do that, delete the RootBone reference (or delete the bone hierarchy) so the CreateBones button becomes enabled. Remember that your new bones need weights, so you also need to update them in the MeshModule. SpriteSkin Inspector will tell you why the setup is incorrect. In your case bn_bod_6 and bn_bod_7 have no Transform reference set, so skinning is not possible and will be disabled. Another feature that is really cool is be able to have separate group order in the same character. That way you can correctly "plug" objects into your character. For example you can place a motorcycle behind one leg and un front of the other leg of a character. theANMATOR2b and laurentlavigne like this. I see, fail early is a valid approach. you didn't want to auto update weights and hierarchy? I think that Bn6 and 7 were deleted by mistake and I pressed undo after that so have a look at undo, it seems that it doesn't revert reference lost. One thing that we relied heavily on was to be able to animatie multiple sprite that were in one single atlas, or even better, have the support to pack them to atlas textures afterwards. We had a lot of weird shaped tentacles in really high resolutions (for 4K support). Without the atlases the game would've been 4 times more than it is. Support ETC + Alpha compression in the new Sprite Atlas please. 1) Please do not tie bones and the bone editor to the Sprite Editor, it is extremely limiting unless you can throw in a whole bunch of other sprites into it and edit it from there. I want this to be like all other animation tools, let me define how I want the skeleton to be and the sprites to go along with it, so basically let me set up my character, then the bones come after. Also want to add sprites to different bones and be able to continue to add/subtract as I work. Otherwise the bone tools themselves are adequate enough. 2) Sprite geometry editor should have a couple more extras, but it is a good start. Having holes is really really nice for certain things. Weighting seems fine, maybe some alpha slider to see the underlying sprites? 3) Needs something to use the mesh for FFD, it all looks like a decent start to something bigger. 4) Needs angle constraints or something for the bones themselves, looks like there is just a bool but nothing to customize it between ranges. 5) Needs some sort of pose editor, again I think there should be some sort of character creation first, then comes the bone creation and pose creation. That's all I have time for now, it has some promise since all this is early, but if you marry that bone tool to the sprite editor, it's going to be dead in the water for more than the simplest of characters unless you want a really hairy workflow. malyzeli and theANMATOR2b like this. This seems great, although on second thought it obviously wouldn't work with pixel art so well. This is coming out in 2018.1, correct? Can't wait! We are aware of the importance of multi-sprite workflows. We are laying down the designs for multi-sprite character workflows. Multi sprite rigging, skeleton sharing etc etc. These are all in Phase 2 and when we lock down the solution, we'll share it. We do have in the (still private) Phase 2 roadmap a pose lib where you can save and reload poses. Thanks for this feedback. FFD is something that we want to tackle a bit later but build the underlying support for it now. Some pertinent areas in Unity are undergoing major changes. We are trying to get the timing right by first focusing on skeletal sprites. StyleA77660, EvOne, theANMATOR2b and 1 other person like this. This should be supported if you can't make it work, please tell us. We have alluded to the 'Package' format in the post title . What that means is we will ship this whole feature as Unity package. It also means we can ship updates/fixes to it within days and not follow the release cadence of the main editor/engine. In other words, we are breaking free from the release cycles of the main product. I hope you guys can experience these with some of the feedback here. This should be easily doable with SortingGroup. If you can't make it work, please share with us. This is one of the main reasons we have Phase 2. As soon as it is ready, we'll share! Thanks for this feedback. Please keep the feedback coming! thanks. tiskolin, Lars-Steenhoff and theANMATOR2b like this. In other words, we are breaking free from the release cycles of the main product. I hope you guys can experience these with some of the feedback here. I use Maya to animate complex animation for my characters because Unity dont support pre-post Infinity Curve animation. If unity can support this feature in the timeline it would be awesome. mahdi_jeddi and laurentlavigne like this. Any word on the vector graphics importer and if this will work with the 2D animator? Currently using SVG Importer. Also, curious if the vector graphics will work work with Tilemap and Sprite editor/9 slicing/UI. Speaking of SortingGroups and sorting order, I want to finally be able to animate them without hacky workarounds, the sorting order and sorting layers should be exposed for all Renderers and SortingGroups so we can finally animate them. Then we can mix 2D and 3D if we want as well in an animation. Ethan_VisualVocal and theANMATOR2b like this. Will the package introduce breaking change for the future update? I would like to use it in real project. I tried my hand at making a new skinned sprite, process was a bit confusing at first as the bone/weight creation was in the texture level, but it works. IK Manager was simple to use ( though I'm not sure what the difference between the two chain types is ). Here's a bit of an animation I did, not much movement but I'd really love to see something like DUIK limbs for those curvy parts. Yeah, I think the limbs I assigned in the IK Manager only covered the mid sections of each limb. Also the number of bones in each limb is to many for the movement I want to achieve. I'll try again with two bones per limb. I'd love to see how it can be processed in a cleaner way, if you want I can post the PNG of my crawler art here. Took another stab at rigging this character, this time with two bones per limb and a cleaner weights setup. I'm starting to really like the native animation tools. moodymagyar and Alverik like this. It looks more natural and with smoother weights in the middle you could remove the kins. Still 4 bones shouldn't be that janky so there is a bug to the IK, it might be the algo implemented or the lack of solving weight, you should report it while their is momentum. I think it's because I didn't do a clean work on the weights and geometry. This was auto generated with mostly some cleaning up near the joints. Use the smooth weight brush, if there is one. Agree - From a quick search this is what is known as Out of Range Limit Curves in 3D Max. Please support animate-able squash and stretch on individual bones and bone chains. The three best features in 3D Max bone setup are these three. Refine allows a bone to be split anywhere the artist chooses - without messing up bone scale, orientation or rotation. Refine can be performed X times on any chain or single bone without error. Mirror is self explanatory but performs all the negative scale correction 'fixes' behind the scenes - really great for artists. And bone edit mode allows for bone length, chain reconfiguring without messing up any bone transform/scale settings. mahdi_jeddi and puppeteer like this. Hi, we are preparing to do the same (release preview package) for our own SVG Importer. Give us a few more weeks to polish it a bit more. Technically, it can be rigged to animate but we are still thinking what we should do when the SVG tessellation don't agree with animation. Anyway, more when it comes out... please stay tuned. nuxvomo, Ethan_VisualVocal, EvOne and 3 others like this. How it's going to work with pixel art characters? is it going to keep the shape of the character or is going to act like unity handle rotation? Improved Scene View gizmos for better manipulation of bone rotation and position. Check the updated documentation to learn more. And as always, let us know your thoughts! nuxvomo, sandolkakos, theANMATOR2b and 3 others like this. @rustum would you consider adding bezier patches (used in rayman legends and seasons after fall) as an alternative to regular mesh skinning? It would be an awesome feature, and we would avoid the need to paint skin weights. Please allow for bone positions and rotations to be easily updated programmatically in realtime. I want to be able to have a 2D character built entirely from RigidBodies and Joints and and every frame, apply the RigidBody positions and rotations to the Bones of the skeletal system. This gives me a physics-controlled character with the skinned sprite deformation. I do this today with Anima2D and just want to make sure I'll be able to continue doing this with the new built in 2D Skeletal system. vietlab, almagames and EvOne like this. I think it's possible from what I tried. The bones can be modified through animation and through code, and the skin follows. I made one of the bones aim at the mouse position to make a skinned character shoot at a point. Bones are regular transforms just like Anima2D. You should be able to control them using the Physics2D engine or scripting. ..oh, nvm.. is see it does have IK.. my bad. 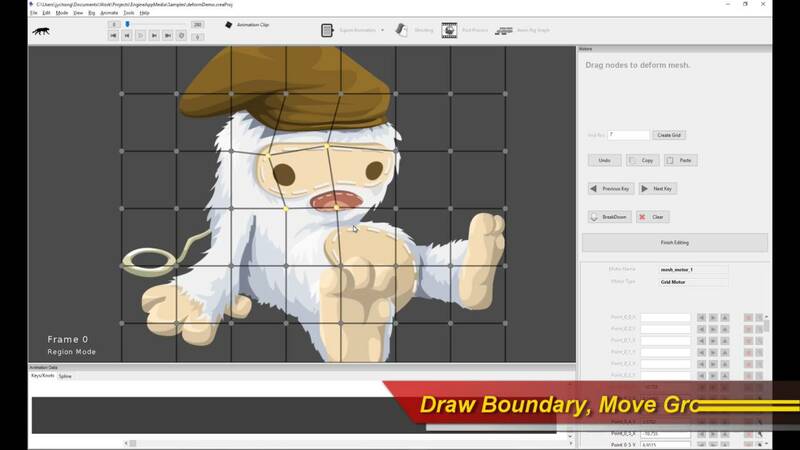 Will it be possible to transfer or import Anima2D SpriteMeshes and Bones integration with weights and skin information into Unity 2018.1 new 2D Animation system ? Right not I have a lot of SpriteMeshes with very complex weights done for every bone, will I be able to move it to new system? What will be with Anima 2D eventually ? alfaodin, malyzeli and EvOne like this. Hi, we are preparing to do the same (release preview package) for our own SVG Importer. Give us a few more weeks to polish it a bit more. Wow!!! ))) -The best news for many long years... THANK YOU!